How cool is this shot of the bride’s shoes! I love taking photos of all of the little details that make up the theme or feel of your wedding. All of your chosen jewelry, including your wedding rings, earrings, necklace, and bracelets are carefully chosen to compliment and accent your chosen wedding gown. The flowers you choose for your ceremony and reception, as well as those chosen for your bouquet, your bridesmaid’s flowers and those that will be worn by the groom and his groomsmen and ushers, are all carefully chosen to set the mood of your event. Your wedding invitation, dinner menus, ceremony programs and other printed materials say a lot about you. You will choose them carefully and I will document them artfully. The overall look of your ballroom, elegantly prepared for you and your guests will be photographed for you to remember forever. Your wedding cake, the cake topper, your champagne glasses...everything...will be captured for a lifetime of memories. But a bride’s shoes usually is at the top of her must-have photographs list. No bride goes without putting a picture of them in her finished wedding album. Traditional white shoes are no longer the norm. The past year or so has seen bridal fashion changes and it is not just acceptable, but fashionable, for brides to wear shoes in deep rich colors or, like these, heavily adorned with sequins. I try to create a unique picture of every bride’s shoes. They are all so different these days and I like my photos to be different, too. When I laid my eyes on this bride’s shoes I just knew I had to create something dramatic. I had my assistant position a pair of small lights to illuminate the shoes and cast a dramatic shadow on the wall behind them. The shiny surface I placed them on allowed for a nice reflection and a zoom lens effect finished the composition. This image was created on location at the deSeversky Mansion and Conference Center, one of my absolute favorite venues for creating elegant wedding pictures. Give me a call to discuss your wedding plans. 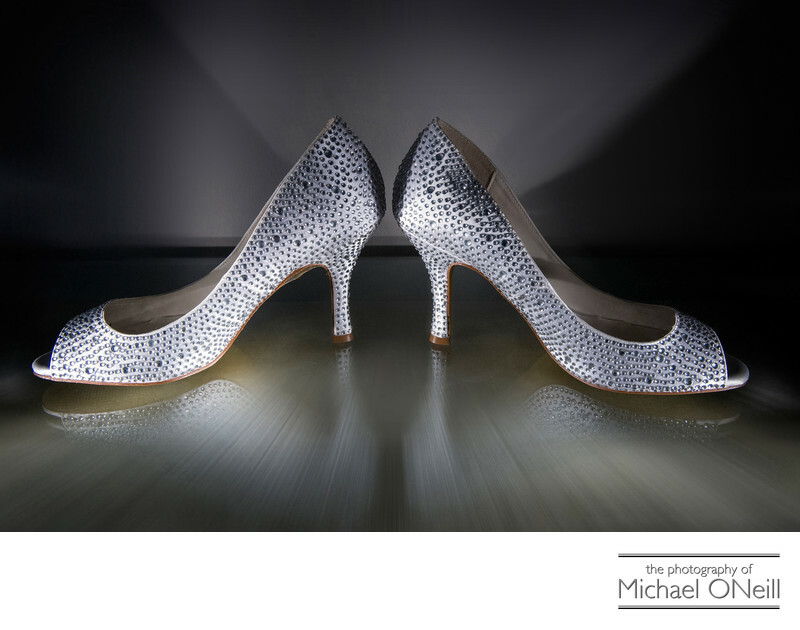 Let me create an awesome shot of your wedding shoes for you, too.